IFA Youth Futsal World Cup selects five players from Leon’s World! Home / Indian Football / Futsal / IFA Youth Futsal World Cup selects five players from Leon’s World! It was a matter of great pride for Rustomjee Urbania and Leon’s World Centre for Holistic Learning and Development in particular when five football players who have been training with them were selected to play football in an internationally recognized prestigious tournament. 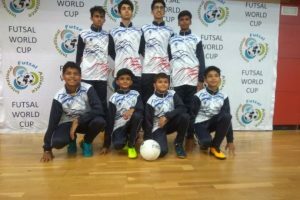 They formed a part of the Indian team that participated in the IFA Youth Futsal World Cup 2018 which was held in Barcelona, Spain from May 21 – 28 organised by European Futsal Association. The young players from Leon’s World have been in training under Coach Vaibhav Karpe who is associated with the VK7 Football Academy. The boys, who have validated all the efforts of Leon’s World to ensure the right mix of sports and other co-curricular activities, are – Om Mishra, Arjun Kapoor, Varad Pashte, Rishi Balhara and Ojas Parab. The Indian team played against teams from Australia, Spain and Blanes. Although they didn’t win, the confidence they gained on playing against international teams is irreplaceable and has buoyed their determination to train harder and better hone their footie skills. Previous Borussia Dortmund sign teenager Achraf Hakimi on loan from Real Madrid! Next Kohler Co. unveiled as Principal Partner of Manchester United!